The Eagles gut-wrenching loss Sunday could be a turning point for their season. In the jubilant Tennessee locker room late Sunday afternoon, Corey Davis was asked how it felt to beat the best team in the NFL. Indeed, it is, and the Eagles are playing more like Super-Bowl chumps right now. Any resemblance between the resilient heroes who paraded down Broad Street last February and the lost souls populating the current roster is purely coincidental. So far, the 2018 Eagles have been an enigma, and never more so than during the overtime of a gruesome 26-23 loss in a sweltering Nashville on Sunday. These Eagles can’t block, can’t tackle and – above all – can’t cover the pass. A wake-up call is no longer sufficient. They’re in a coma now. During his weekly appearance on my WIP radio show this morning, coach Doug Pederson keeps insisting the problems were all fixable – nothing all that unusual for a team coming off a miracle Super-Bowl season. Everything will be fine, he said. Just a bit of fine-tuning, and Sunday afternoons will be peachy again. Don’t believe it. First of all, no tweak will suddenly fix journeyman safety Corey Graham, who allowed Taywan Taylor to wander alone near the sideline for a first-down catch on fourth-and-15 in the defining play of overtime. No adjustment will get Jalen Mills to stay with enemy receivers. No correction will teach Ronald Darby how to tackle. 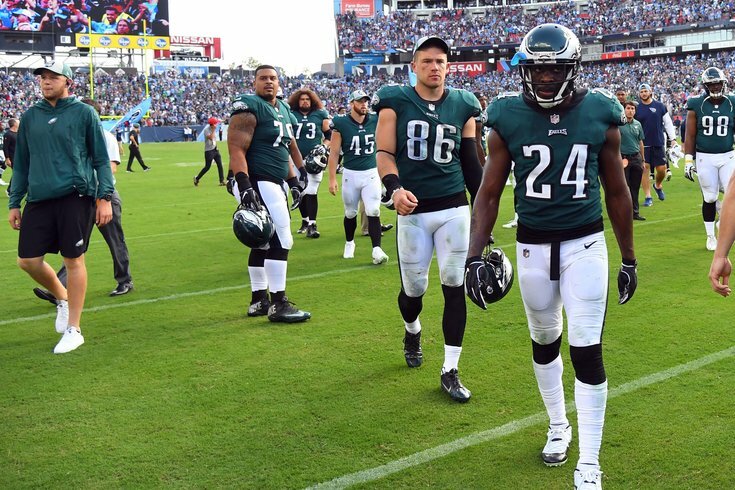 If you haven’t noticed yet, the Eagles secondary is among the worst in the NFL, and the truth is, it wasn’t all that good last season, either. Surely you recall that Patriots managed to amass 500 passing yards in the Super Bowl against these matadors. The big difference is, this year the Eagles are making every quarterback look like Tom Brady now. Meanwhile, the offensive line – a strength last year, even after tackle Jason Peters went down – has become a sieve, allowing rusher after rusher into the backfield to pound Carson Wentz. The young quarterback absorbed 15 hits on Sunday, including four sacks. I asked an orthopedic surgeon this morning if he approved of that kind of abuse on a recently-rehabbed knee. He did not. And then there is the coaching, perhaps the biggest plus in the latter stages of last season. Remember the Philly Special? How about all of those brilliant fourth-down gambles, or the masterful play-calling in the biggest drives of the playoffs? Well, there has been no evidence of that brilliance this season. For example, with Wentz under siege, Pederson still dialed up 50 passes and 22 runs during the Tennessee meltdown on Sunday. His running game was averaging over five yards per carry, and still he abandoned it at the first sign of trouble. It brought no joy to me a month ago when I predicted here that the Eagles would not repeat as champions. I based that forecast on their putrid showing in the preseason, quietly hoping that the team would flip the switch when the season began. It hasn’t. After four games, the Birds have still not put together one solid performance. And they will continue to struggle until defensive coordinator Jim Schwartz starts coaching more aggressively, until the defensive backs start covering the receivers, until the entire defense refreshes its memory on how to tackle, until the offensive line becomes more committed to protecting Wentz and until they all shake the confetti out of their hair and play like the champions they once were. This is a new year, but the way the Eagles are playing right now is getting old real fast.